We have seen that Middle School and the onset of puberty have been marked by a slight drop in math pass rates statewide but not in reading. 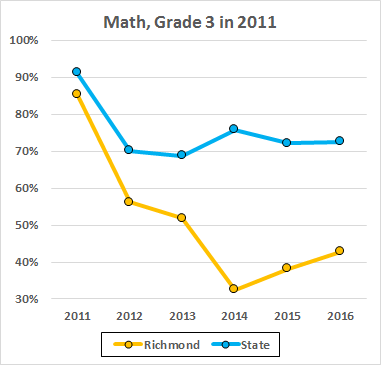 In contrast, the sixth grade brought plummeting pass rates in both subjects in the Richmond schools. Those data mostly looked at the period before the new math tests in 2012 and the new reading tests in 2013. Today let’s look at the third-graders of 2011 and the progress of their group up to the past school year. To that end, here are the pass rates of the third graders in 2011, the fourth graders in 2012, and so on. Let’s start with the reading pass rates. The new tests dropped Richmond’s fifth graders to 23 points below the state average, while the same group scored six points below the average in 2012 (under the old tests). The same group dropped another ten points when they entered middle school in 2014; in the eighth grade that group remained 31 points below the state average. The math scores are even more dramatic. The group went from six to fourteen points below the state under the new tests in 2012, and dropped another three points in the fifth grade (2013). Then came middle school: In the sixth grade the (mostly) same students fell to 43 points below the average. In 2016 (eighth grade) the group remained 30 points down. 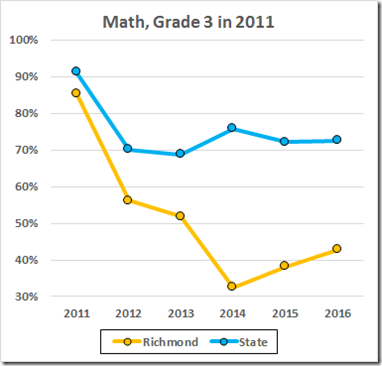 As before, we see two effects here: The new tests whacked the Richmond scores in both elementary and middle grades, especially in math. The middle schools took students who had been performing below average in elementary school and devastated their performances, especially in math. These data don’t tell us what is wrong with our middle schools; they do tell is that, whatever it is, it is horrible.